It has some great design fetaures and has won an Australian design award. 2 fixed seat reclining positions, fixed with locking clips. 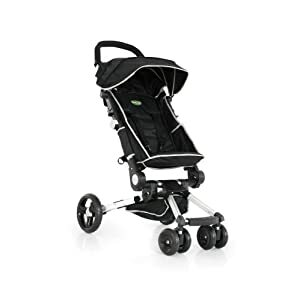 Ultra compact 2-handed flat folding stroller. Folds forward and then back to give one of the smallest folds available. My first thoughts were that this was an extremely compact, convenient and lightweight, sroller that looked good too. My tester young Harry seemed to really take to it. He sat comfortably and happily and seemed relaxed. It has a revolutionary folding system which means it can be set up in seconds, using one hand. Here is Harry’s dad Mark folding it up. It took him a few goes to suss it out but then found it super easy. Oh and don’t forget always carry stretchy grip tab nappies in a waterproof lining nappy bag if you don’t want leaks over new strollers!!!! !.